The right cookware will not only improve your enjoyment during meal preparation, but it can also make your food safer to eat. With so many options to choose from, it’s helpful to first learn about the types of cookware you should avoid. Cookware comes in a dizzying array of materials, including stainless steel, ceramic, cast iron, aluminum, copper and blends of these materials. Special coatings are often used for various purposes and may help improve heat distribution, prevent sticking and provide protection against corrosion and tarnishing. The best cookware reviews will include information on the heat conductivity, durability, reactivity and maintenance specifications for the pots and pans that are reviewed. Without this information, you can’t make an informed decision about the cookware you intend to purchase. T-Fal makes some of the best nonstick cookware available on the market. Professional chefs often use these pots and pans in their home for the high degree of reliability, durability and effortless heating. This pan boasts a hard anodized construction that will give you exceptional durability, which makes this one of the best cookware set options you’ll be able to find. Heat Conductivity: Aluminum is second only to copper when it comes to heating. This makes the pan an exceptionally good pan for chefs who need to make quick temperature changes to ensure their food is cooked properly. The hard Titanium nonstick surface offers good heat exchange from the aluminum core to your pan, so you can enjoy perfectly cooked food every time. Durability: If you want a strong and durable cooking pan, this is an exceptional choice. It’s made to be dishwasher-safe, employs anti-warp technology and it’s also safe for use in the oven. You’ll want to make sure the pan cools down before you clean it, but this pan will last you a long time provided you treat it well. Reactivity: When it comes to chemicals leaching into your food, there can be no compromises. This pan uses aluminum as the core, which is a material that is known to leach. However, like most aluminum-based cookware, the interior coating prevents the aluminum from making contact with your food. This makes this pan a safe pan that is PFOA-free to ensure you’re getting a clean cooking experience. Maintenance: Since you can easily place this pan in the dishwasher for easy clean-up, this pan should last you a long time. The materials are designed to withstand extreme heat, you’ll just want to be careful not to quickly cool down the pan after cooking. This pan doesn’t require any special seasoning to keep it in good condition. A little soap and water is the best option for keeping this pan in good condition. Hard-anondized Titanium interior offers a durable design. Oven-safe temperatures up to 400 degrees Fahrenheit. Silicone handles stay cool and provide additional safety. Thermo-spot heat indicator lets you know when the pan is pre-heated. While the handles are designed to stay cool, you’ll likely still need a glove to handle these pots and pans. The heat indicator only seems to display with extremely high temperatures. 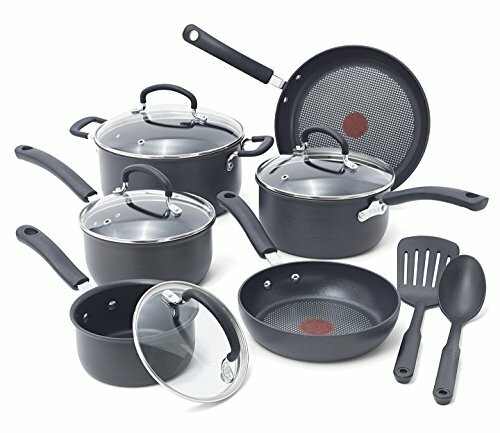 Before you move on to the review, it is important to understand the content of nonstick cookware set. A cookware set is safe for healthy cooking when it has no lead or cadmium content. And this is where GreenLife Soft Grip Cookware Set has an edge over other models within the same price range. It is manufactured without PFOA (Lead or Cadmium content). But that’s not the only reason you should have this cookware set in your kitchen. It is stylish, has attractive color and offers everything you expect from a cookware. Thermolon ceramic coating has been the trademark of GreenLife pots and pans. The makers realize that thermolon has better thermal conductivity than other substances. Combined with aluminium body, 2 healthy ceramic coating ensures that GreenLife Nonstick Ceramic Cookware Set consumes less heat and offers much better results than other cooking utensils. Another benefit of thermolon coating is, it keeps your pots from scratches. That means your frying pans and pots will stay attractive for a long, long time. Moreover, thermolon coating also prevents threats of thermal shocks. Another prominent feature of GreenLife Ceramic Cookware Set is its Soft Grip. All pans feature Stay-Cool Bakelite handles that are also soft to hold. As a result, you’ll feel the pan lighter than its normal weight. The handle can withstand extreme heat of frying, roasting and sauting. The base of the pans and pots ensure that your food gets proper and even heat. Moreover the hard coating makes sure you can cook, fry, roast or saut your food without any worry. And, if the food is overheated, there will be no signs of toxic fumes. To go with lovely turquoise ceramic pots, you’ll get glass lids of different sizes. Glass lid ensures you can monitor your food without having to lift it. So, in one way, it keeps the heat and nutrition safe inside while cooking. With so many benefits, especially the price, resistance against high temperature (above 350oF) is the only downside of this product. Ceramic coating starts to come off as the temperature goes beyond this limit. Glass Lids: Glass lids make the job a lot easier for you while cooking. You can visualize the food and know exactly when to stop. Therefore, you won’t have to play the guessing games all the time to check if the food is cooked or not. Ease and Convenience: The pans are made of aluminum so they are extremely light. Handling, transporting and storing becomes very convenient. The nonstick coating doesn’t stand up well to metal utensils. Black is color of style and class, and if you demand a cookware with intriguing finish, you wouldn’t get it in any other color. The cookware looks spectacular and its finish ensures that it will stay in your kitchen for a lifetime. As far as design is concerned, there is no innovation in it. All pots and pans have traditional design, but they all are user friendly. Unlike traditional cookware, most nonstick pots and pans have anodized coating. 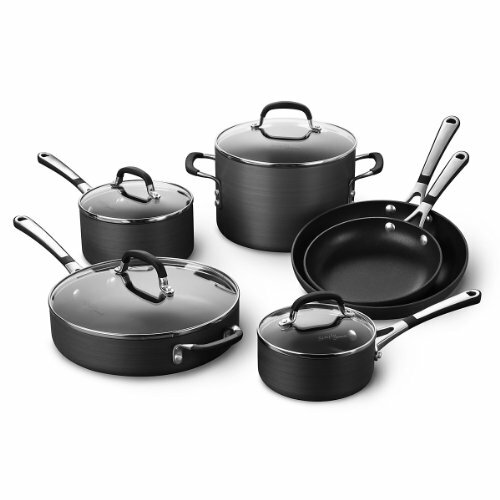 Simply Calphalon Nonstick Cookware Set has a hard anodized coating for even and precise heating. It ensures that the food doesn’t have any undercooked corners. Anodized coating also conducts heat better and so, your cookware reduces heat loss. Hard coating also keeps your pots and pans from scratches. Signature Calphalon nonstick coating on the base makes this cookware set one of the best in the U.S and worldwide. Nonstick base not only prevents food particles from sticking to the pan, it also preserves taste and smell of your food. Glass lids have become quite common, because they don’t only add to the attractiveness of the cookware, they make sure you don’t have to lift the lid to see the status of the food. Transparent glass lids of Simply Calphalon Cookware Set complement the black finish well enough, increasing the visibility of the food so that you can see all the ingredients while cooking. The cookware set is relatively heavier than others in the industry, but that’s also the sign of strength and durability. You’ll get a lifetime warranty for most Simply Calphalon products, but some might have 10-year warranty. So, you need to talk to the makers before claiming warranty. Calphalon is an exceptional brand that produces high-quality products. This set includes the most important pans for cooking. The glass covers are tempered for extra durability. Hard-anondized aluminum construction provides excellent heating and conductivity. PFOE-free nonstick coating ensures prolonged durability and strength. The pans aren’t dishwasher safe. Be careful with the coating since it can easily scratch. We don’t need to praise Cuisinart for its kitchen appliances and utensils, as their products speak for themselves. Among popular products, Cuisinart 66-14 Chef’s Classic Nonstick Hard-Anodized 14-Piece Cookware Set is arguably the most talked about product online. Let’s find out why? To start with, price and affordability has always been a concern Cuisinart answers in the best way. This cookware set offers 14 high quality pieces at a fairly reasonable price. Two saucepans, 2 skillets, a stockpot, a saute pan, pasta steamer and steamer insert, along with glass covers, this cookware set has nothing useless for your kitchen. All pots, pans and skillets have hard anodized aluminum core on the exterior and the interior features quantanium interior. Quantianium is the titanium reinforced material that ensures safe, nonstick and healthy cooking. Anodized coating makes sure that the food gets proper heat from the base and walls of the container, and quantanium interior prevents food particles from sticking to the base or walls. Nonstick interior also takes less time and effort during cleaning. Unlike other nonstick cookware with substandard handles, 66-14 Chef’s Classic Nonstick Cookware Set features riveted stainless steel handles that don’t get heated on stovetops. Then you can see the cast stainless steel grip that offers secure grip and ease in lifting the pan. That means you can lift the pot from the burning stop without any difficulty. Glass covers ensure visibility and they feature tightfitting lids made of stainless steel. Lock lids prevent steam escaping and keep the flavor and texture of the food while cooking. You can use the cookware on stovetop, under broiler, or even in ovens. This is due to the high level of temperature reading for a nonstick cookware. Yes, Cuisinart 66-14 can withstand up to 500 oF, and at the same time, the pots can be used as storage containers in freezer. All pots and pans are made of aluminum, so they tend to take less time for cooking. Although, all these features prove that the cookware can last for a lifetime, you can still claim warranty, if needed. Quantanium nonstick interior provides an excellent nonstick surface. The aluminum core makes these pots and pans exceptionally light. Covers are very tight fitting, so you can easily monitor your food. The stainless-steel handles are designed to stay cool throughout cooking. Comes with steamer inserts for vegetables. The nonstick interior is safe for metal utensils, but you should still be careful as it can scratch. The non-stick pasta insert can be difficult to clean. This nonstick cookware set from Cook N Home is all about affordability, attractiveness and nonstick cooking on stovetop. Although, it’s not as efficient as high-end cookware set, you’ll fall in love with the design, feel and color. As said, the cookware is made specifically for traditional, stovetop cooking, its thick gauge aluminum base ensures that the utensil doesn’t get any hot spots after several hours of cooking. Because of the thickness of the base, the heat conduction of this cookware is excellent. So, you can cook hard pieces of meat or vegetables, such as beans, that take a lot of time to cook. Normally, cheap nonstick cookware can cause issues of hygiene. Some might have contents of Lead or Cadmium, or both, that are quite dangerous for health. So you need to make sure that they are safe for healthy cooking. 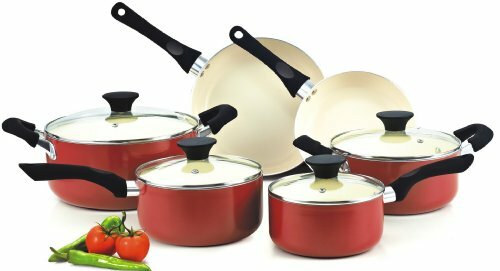 With Cook N Home NC-00359 Nonstick Ceramic Coating 10-Piece Cookware Set there is no such issue. It features a ceramic based coating which is PTFE and PFOA Free, and there is no threats of Cadmium or Lead content as well. Nonstick coating also ensures that you spent less time in washing and cleaning the cookware. Moreover, it also protects your cookware from stains and scratches. You might not be falling for the cookware set just because of the color, and want to know whether it has a potential to bear high temperature. Special agents have been used in the color of NC-00359 Cookware Set so that it doesn’t come off on excessive heating. Furthermore, the color remains there for a long time. Aluminum handles have anti-slip coating that offers comfortable grip and feel. The handles are also sturdy and can withstand high temperature. At the same time, the handle material isn’t properly coated, so you cannot place the pot in microwave oven. This is the only downside of this cookware set. You want to know how your food’s doing in the pot, so tempered glass lids make sure you don’t have to lift them to monitor the status. But make sure you don’t use these pots and pans on induction stovetops with the glass lid on. 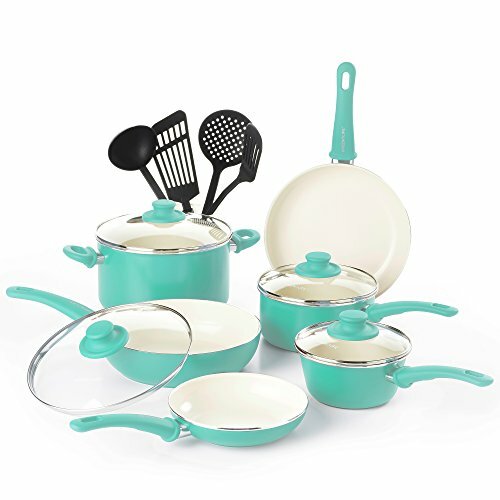 The cookware set comes in two color possibilities. An easy to clean exterior with heat-resistant paint makes this a good choice for busy people. Tempered glass makes it easy to view your food throughout the cooking process. Thick gauge aluminum makes this set extremely heat conducive. Ceramic coating prevents leaching of metal from the aluminum core. Can’t use this set on an induction stove top. This set can’t be placed in the dishwasher. If you’re health conscious, have kids or elderly in your family, you will be more keen to cook hygienic food, and that’s quite possible with the best nonstick cookware. Or, if you’re a working women, you may be looking for a utensil that doesn’t require too much time in cleaning. Well, there may be other concerns, but nonstick cookware has answers for all of them. There are lots and lots of benefits of using nonstick cookware set. Some of them will be unleashed as you learn to use them, but here are some really important ones that indicate how efficient and convenient these appliances are. Less oil/fat consumption: You must be aware that other types of pots and pans require extra oil at the base and sides, so that the cooked food should not stick. Well, that’s certainly not the case with nonstick cookware. That means, nonstick cookware will reduce your oil or fat consumption significantly. Less time in cleaning: In connection to the above mentioned point, you can imagine how cumbersome it is to clean a pot with oil and fat. Or if you forgot to pour oil before cooking, brace yourself to fight with stubborn food particles and use some elbow grease to remove. Nonstick pots and pans are fairly easier to clean, takes less water and saves time. Smooth flow: As you cook the food, it needs stirring from time to time. Other cooking pots, especially metallic pots develop scratches and rough spots at the base, due to which stirring can be slow and unsmooth. Nonstick pots have no such trouble, because of the thick layers of polymer coating. Long life: You can keep them for long if you use plastic or wooden spoons. Metallic tools can scratch off the PTFE coating if you kept using them for long. Better for gravy: Nonstick pots and pans have been recommended by Tony Polombo, a seasoned writer, for preparing stews and gravy items. Since they’re nonstick, they produce more gravy by adding the fond (caramelized dripping from the cooked meat that can stick to ordinary pan). The nonstick pot can help deglaze the fond and dissolve it into the liquid. Now, that you know what makes a good nonstick cookware, you’re all set to buy the right pieces for your kitchen. Here are few things you need to consider while choosing the best nonstick cookware set. Cooktop: first and foremost, you need to see the bottom of the pans and pots in the set. If you have smoothtop range, pans need to have flat bottoms. Even if all the pans have flat bottoms, you can double check using a straight edge. If your cooktop works with induction heating, you need to choose magnetic stainless steel for better and smoother performance. Be careful while choosing pieces: So, you’re looking for different sizes of skillets, pans, stockpots and lids. If you’re purchasing for the first time, keep in mind that manufacturers count every single item as a piece. Cooking pan is a separate piece and its lid is a separate piece. A single lid can fit on more than one piece so, don’t care too much about getting a separate lid for all bowls and pans. Similarly, stirring utensils, note book and instructions manual will be counted as pieces. The more pieces you have the more space it will occupy, and soon you’ll realize that apart from two or three pieces, rest are useless. Have a Feel: You may be interested in buying nonstick cookware online, but if it is possible for you to visit a nearby retail shop and physically examine a few pieces, that will help you in making the right purchase decision. After removing your doubts, you can always go to amazon.com, find the cookware and purchase. It is very important to handle a cookware before purchase, because you need to ascertain it feels not too heavy or not too light in your hands. You can then imagine how it might feel when it’s completely packed with food. Also see, whether the pan has a durable and handle and how it is attached. Handle must be tightly attached to the pan and must be in balance. If you cannot find a place to physically examine the pans, you can take help with nonstick cookware reviews and FAQs available online. Understand the terms: Understanding certain terms is vital, and can actually save you from spending extravagantly on the cookware. Cast iron cookware normally has a label “pre-seasoned”. It means that the nonstick pan was coated with wax, to prevent rust on the metal. Then there are some pans that need pre-seasoning before use. So, take a look at the manufacturer’s manual before use. Don’t fancy hard-coated anodized aluminium too much, because it’s a soft aluminium changed into hard surface, and it has nothing to do with nonstick coating. Another term “Clad” has been used with many cookware items. It merely means that the nonstick pot is made with different metal pieces fused in one place. So, the pot may have an outer and inner lawyer of stainless steel, but the middle (the core) layer is made of aluminium or copper, or may be a conductive magnet. Clad is also used to describe a material that has been attached to the bottom of the pot, to speed up heat transfer. Another term, that may confuse you is, “Oven safe”. It means that all or few of the items can be used in ovens for cooking food. If a piece is labeled oven safe, make sure it’s handles are made of metal. Silicone handles can withstand a certain temperature too. Do not put the pan inside the oven if it has plastic or wood handles. If you are searching for the best nonstick cookware and are not sure which one’s best for you, following are some things you need to consider before making your decision. Regardless what you’re buying; a single piece or a whole cookware set, the major things you need to keep in mind pertain with the weight, metal type, smooth cooking, oven-safety and other related essentials. So, let’s take a look at these factors in detail. Weight is always a tough act to balance. Heavier pans are good for cooking because the surface of the fan allows for even heating. At the same time, they’re harder to clean, and handling also needs effort. On the other hand, light pans and pots have less even surface for cooking, but they are more convenient when it comes to cleaning and handling. So, a mid-weight cookware set would be an ideal choice. If you’re purchasing one piece than, you can buy a heavy weight item, because it will be more durable. Heavy item are expensive compared to mid-weight or lightweight pans. Metal durability is quite important in a cookware set as it is directly related to the life-span and investment. There are different kinds of metals for nonstick cookware, and stainless steel, copper, anodized aluminium and cast iron are the most common ones. Cast Iron: When it comes to durability and feel, cast iron tops the list of metals. It’s also the heaviest material for pots and pans which also makes it difficult to clean and care. Unless cast iron has a proper coating, you need to put a lot of oil to cook something in a cast iron pan. Anodized Aluminium: Anodized aluminium is the second hardest material. The material is fairly easy to clean; is less expensive and has less weight than cast iron. But if you’re using uncoated aluminium pan, the food will soak up some of the metal while cooking, because aluminium is a reactive substance. Copper: Copper is an excellent material for pans and pots, because it has a tendency to adjust quickly to the heat changes. The heat will be distributed evenly throughout the utensil. But the metal is very expensive and also needs high maintenance cost. Most of the old utensils of copper are lined with stainless steel, and they have tin coating from the inside. Stainless Steel: If you want to have a fresh start in the kitchen, stainless steel cookware will give you the best one. This material is high on demand because of durability, performance and reasonable price range. Aluminium cookware with stainless steel clad on it, is highly recommended for nonstick cooking. They may be a little expensive, but performance-wise, they’re far better than those pans that have aluminium disk attached at the bottom. Nowadays, induction burners and stoves are in demand. This type of heating is popular in the United States, Europe and Asia. Instead of copper coils used in electric stoves, Induction heating follows an electrical-magnetic process that transfers heat to the bottom of the utensil. So, the cookware should have a little amount of iron; either an additional disk or coating on the outside, to be able to qualify as induction compatible cookware. People often buy skillets, saucepans and pots to use them on stovetop, but if you can use nonstick cookware in an oven, it’s an excellent capability. So, if you’re getting one at a reasonable price, that’ll be a bonus. Remember, oven-safe cookware have metal handles, not the ones made of plastic or wood. Different kinds of materials are available in the lids’ department, but glass lid has been more popular than any other material. What’s more important is, the lid should fit the top of the pan, and when needed, it can be removed easily too. Do you know, you can judge the quality of the cookware, just by looking at the quality of the handle? Well, that’s not the true gauging criteria, but most of the time it works. The reason is, a low-end cookware brand would ideally choose low-quality handles and lids for cost-saving. And also, handle may be the first thing in the pan that can get you in trouble. So, what should you do? The handle must be solidly attached to the pan and should be made of metal. Metal handle will add convenience to use the utensil on the stovetop, as well as in the oven. At the same time, do not touch the hot metal handles without wearing protection. Or you can choose a pan that have metal handles and rubber guards on it. This allows you to detach the rubber guard when putting the pan in the oven. Who wouldn’t want value of the money spent on nonstick cookware? So, if you’re getting a product with a warranty, that’s the benefit. Manufacturers often provide limited warranty for a year, two-year, while some cookware have a lifetime warranty. So, always ask for the warranty as it secures your purchase. Moreover, to claim the warranty, you need to meet and comply with all the instructions stated in the manufacturer’s manual. Nonstick cookware set is always a good option to be had in the kitchen, but pros and chefs recommend they should be used complementary to the traditional (uncoated pots and pans). Anyhow, if you’re one of those who are not in favor of this particular cookware because of bad publicity, correct your facts, because nonstick cookware complies with rules set by the environment protection agency. In 2015, the agency confirmed that nonstick cookware do not have any PFOA concerns, as the chemical is completely consumed during the manufacturing process of the cookware. Manufacturers and experts have come up with some handy tips to use nonstick cookware safely and efficiently. The cookware will also remain in good condition for years. Using First Time: According to manufacturers like Calphalon, when you use your nonstick set for the first time, apply a thin coating of vegetable oil on the cooking surface. In this way, the cooking surface will be conditioned and remain protected for long. Preheating an Empty Pot: Unlike ordinary pans, nonstick pans should not be preheated. This is due to the material of the cookware. Normally aluminium is the core material of nonstick pots, and it heats up quickly because of the low density and less weight. If Preheat is Necessary: Add some oil that lightly covers the cooking surface. Preheat the utensil for just a few seconds, then add food in it. Nonstick Spray: Instead of using nonstick cooking spray, you can use grapeseed oil or vegetable oil to condition the pan. That’s because, lecithin present in nonstick cooking spray will make the cooking surface less nonstick and more gummy. Cook on Moderate Heat: Low to medium heat is preferable for nonstick cookware. High amount of heat degrades the coating. Some coatings, on high heat, generate toxin vapors and cause health issues. Oven-friendliness: You need to check the product manual, in order to understand whether your cookware is suitable for ovens or not. If it is, then check the maximum temperature it can bare. Oven-safe cookware are also available in the market, but most brands don’t offer such utensils. There are a few good reasons for it. Don’t Use on Extremely Hot Burner: Nonstick utensils cannot withstand excessive heat, but stainless steel cookware can. That means, if you’re cooking something at a temperature of over 660oF, do not use a coated appliance. Make sure that the burner is not too hot before placing the appliance on it. Avoid using it on the broiler. It will not only deteriorate, it can cause polymer fume fever. Metal Spoons Should be avoided: As said before, metal utensils are not meant for nonstick pans and pots. They have sharp edges that can scratch the coating, and there are more chances of it when the pot is being heated. Replace Immediately: Even if it belongs to the best ceramic cookware, the nonstick utensil MUST be replaced as soon as it shows signs of deterioration. Scratches and patches will only increase your problems. Ensure safety: While cooking, keep your kids and pets away. Most people leave damage pots and pans for birds and pets (for feeding), but don’t take risk with damaged ceramic pots. The removed coating can be lethal for birds. Maintaining your nonstick cookware set is not as difficult as for ordinary cookware. If you follow these tips, you can easily use the nonstick cookware set for at least 3 years. Apart from warm water and dish washing detergent, make sure that the sponge is non-abrasive. You can use a soft dishrag for cleaning. Abrasive cleaners that have hard and rough surfaces are bad for your utensil. Don’t use steel wool at all. If the food gets stuck somewhere on the pan’s surface, scrub it off with the help of baking soda and water. There are some other non-abrasive cleaners, such as soft scrubs or Bon Ami. Most of the time, you come across a cookware that’s known to be dishwasher safe. Even if your ceramic cookware is safe for dishwashing material, try to wash it with hand as much as possible. If the water is too hot or the detergent is too harsh, the surface of the cookware will corrode easily. Avoid stacking nonstick pans and pots, because this may result in scratching or chipping. However, if you don’t have too much space, you can stack your cookware by putting a thin towel between two utensils. So, you’ve learnt a great deal about the essentials of the best nonstick cookware set. You’ve now seen how you should go about choosing the right cookware set and what things you should see in order to make the right decision for your kitchen. Nonstick cookware are certainly good for cooking with low oil and fat content, and it suits adults and overweight people. The downside of nonstick material is, it cannot withstand high amount of heat and can be damaged if rubbed against metal utensil. Here is a summary of what we discussed above. According to the best chefs and cooking experts, you can always choose an entire cookware set, but you should have reasons to make use of all the utensils. Always consider the weight of the pan, the material and the kind of coating on it. Nowadays, anodized coating makes exceptional cookware that can be used on traditional stovetops, induction heating tops and ovens as well. Always pay attention to the handle and its quality, because it will give you an idea whether the brand is good or not so good. Pay attention to the maintenance and usage. Use the pans only on mild to low heat. Do not use metal utensils to stir the food in nonstick cookware. Make sure that the item you’re purchasing should have a warranty of some kind. That’ll secure your transaction. These cookware reviews must have helped you in finding the right choice. You can always come back for more updates, because we keep updating our cooking tools for better.